My first game jam game, and my first published game. I've been working on a real game in Unity for a while and decided to do this jam as a break from it. I don't really feel like this represents what I've learned about Unity and I didn't have much time to tweak the gameplay, but it is playable, includes 5 levels, and can be finished. It's just exciting actually releasing something, even if it is extremely simple. As a general comment, congratulations for this first published game and keep continuing! This game is a fun challenge. I played the first two levels but would have played more if I could retry the level when I failed as I had to go back to level 1. This game is difficult! I don't think I'm cut out for transporting drop bears. Neat little thing. I like it. 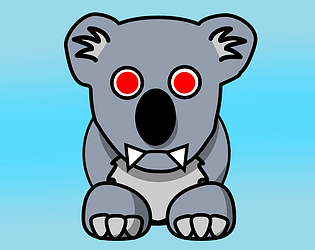 The actual physics of the dropbear are pretty unusual, but once you get the hang of keeping him on the platform, it's a fun challenge. I have to admit, I only beat the first two levels by fluke (getting the platform+bear near enough to the green zone before they separated), but the third was too difficult for me. Props on completing something playable. Although it could have been more well polished with things like a menu and etc. It is one of my favorites game in this jam, the concept is good, and it is fun to play. Good work man !